We are now rated the #1 Disc Golf Course in the State of Ohio! The Disc Golf course, located to the right just after you enter the park, is open to the public and there is no charge to play. The entrance is marked by the kiosk, shown here to the left, where you can pick up General Information on Disc Golf, course map and score card. The first tee is a short walk as you follow the trail leading off to the right. The course is currently 18 holes with red, white and blue tees. Our course also features a playable island shot on hole #2 with floating bridge to reach the island. This wooded course works its way along the eastern edge of Pine Lake. Each hole is identified with a marker indicating the holes specifications and each has a beginner, intermediate, and advanced tee. 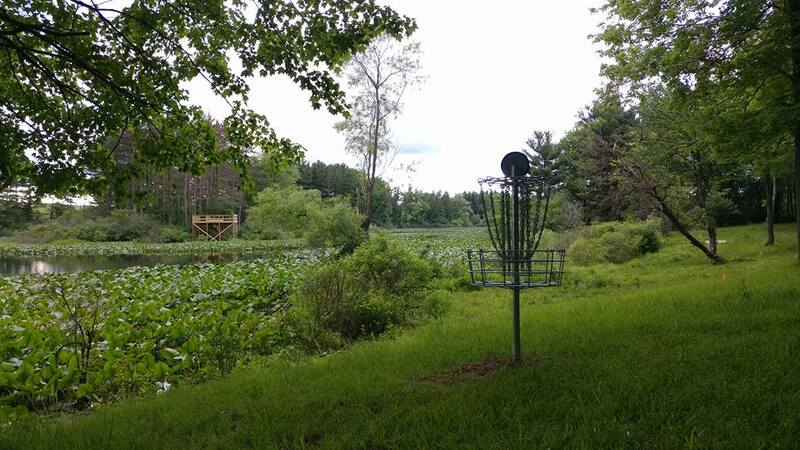 If you do not have Disc Golf discs to enjoy this beautiful course you can rent a set from the Campground Check-In Station or purchase discs through the Friends of Punderson during our local leagues. 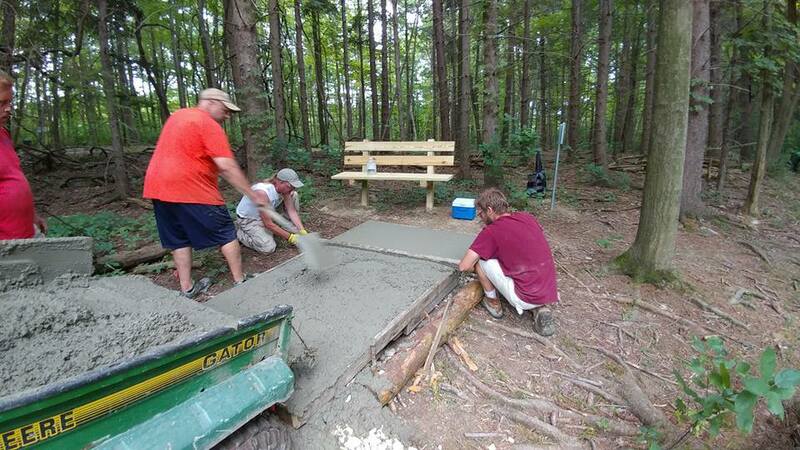 The area Disc Golf Club, along with Friends of Punderson members plan several tournaments throughout the year. 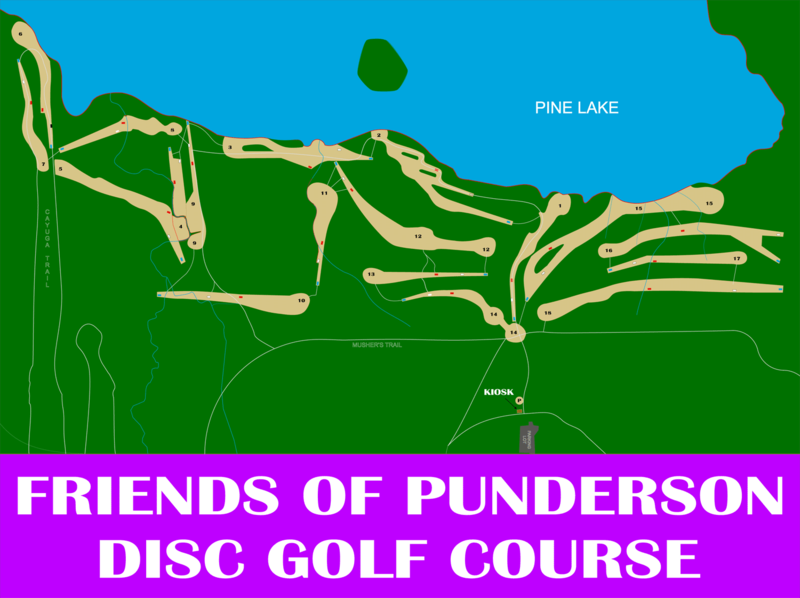 You can also see all their latest events, leagues and updates at http://PundersonDiscGolf.com. The game of disc golf is played much like regular golf, only with flying discs and standing baskets to catch them. The object of the game of disc golf is to traverse a course from beginning to end in the fewest throws of the disc. The competitor who plays the stipulated round or rounds in the fewest throws plus penalty throws is the winner. Play on each hole begins at the teeing area and ends at the target. After the player has thrown from the tee, each successive throw is made from where the previous throw came to rest. On completing a hole, the player proceeds to the teeing area of the next hole, until all holes have been played. 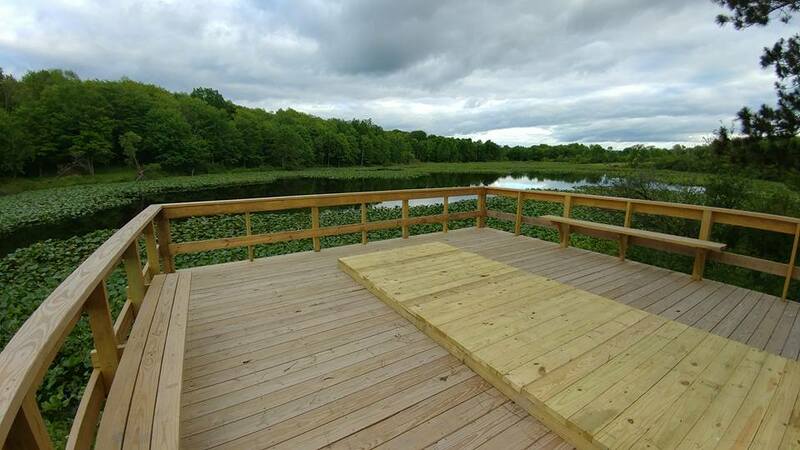 Disc golf courses are normally laid out in and around wooded areas with diverse terrain to provide natural obstacles to the flight of the disc. These natural obstacles are very much a part of the game and must not be altered by a player in any way to decrease the difficulty of a hole. Players must play the course as they find it and play the disc where it lies unless allowed otherwise by these rules. A disc that comes to rest in the Disc Pole Hole basket or chain constituted successful completion of that hole. Landing on top of the basket, or hanging on the edge of the basket rim do not count. Any disc that comes to rest above the ground is considered an un-playable lie, such as landing in a tree. The disc must be thrown from the lie on the ground, directly underneath the un-playable lie. A disc that lands in the lake will be played from the point the disk entered the lake as an out of bounds thrown. Please pick up trash and help new players play by the rules. You are the one that makes it work. By your example, Disc Golf will change your life and theirs too. Remember the most important rule: The one who had the most fun wins! Tee off & fly freely.